Image caption Julian Assange said Ecuador's decision was a "historic victory"
The UK and Sweden have criticised Ecuador for granting political asylum to Julian Assange as the diplomatic row over what to do with him intensifies. 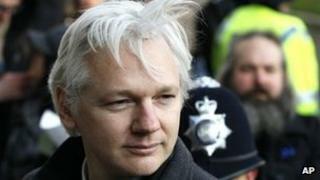 The Wikileaks founder took refuge at Ecuador's London embassy in June as he faced extradition to Sweden over sexual assault claims, which he denies. The UK has said it will not allow him safe passage out of the country. Ecuador's Foreign Minister Ricardo Patino said he hoped talks with the UK would "overcome this". He told BBC Mundo the UK should respect Ecuador's "sovereign decision" otherwise "we will use the alternatives under international law to demand the safe passage". "We don't think it is reasonable that, after a sovereign government has made the decision of granting political asylum, a citizen is forced to live in an embassy for a long period," he added. Mr Patino also claimed "other elements" were motivating Sweden's wish to extradite Mr Assange, and tweeted his "sincere appreciation" to the national assembly in Ecuador which passed a resolution condemning the "threat" to Mr Assange's political asylum. However, Swedish Foreign Minister Carl Bildt said his country would not be lectured by Ecuador. Mr Bildt said Sweden was entirely within its rights to question Mr Assange about a serious alleged crime. He denied that Mr Assange would ultimately be extradited to the US to face the death penalty. Ecuador has said Mr Assange's human rights might be violated if he were sent to Sweden to be questioned over allegations that he sexually assaulted two female Wikileaks supporters while he was in Stockholm to give a lecture in 2010. Media captionClaes Borgstrom, lawyer: "This has nothing to do with Wikileaks, and I feel very sorry for my two clients"
The Wikileaks website has published a mass of leaked diplomatic cables that embarrassed several countries, particularly the US. The 41-year-old Australian citizen, who claims the sexual contact was consensual, has said the allegations against him were politically motivated and he feared that, if extradited to Sweden, he would then be passed on to US authorities. The Swedish foreign ministry has rejected Ecuadorean claims that the sexual assault allegations facing the Wikileaks founder were not the real reason the country wanted him extradited. Mr Assange said that while Ecuador's decision was "a historic victory, our struggles have just begun", adding that "the unprecedented US investigation against Wikileaks must be stopped". The UK Foreign Office said it remained committed to reaching a "negotiated solution" but following its obligations under the Extradition Act, it would arrest Mr Assange if he left the embassy. UK Foreign Secretary William Hague said there was "no legal basis" to allow Mr Assange safe passage out of the country and warned that the case could go on for a "considerable" time. In a statement issued after the Ecuadorean decision, Mr Hague said that Britain was under a "binding obligation" to extradite him to Sweden. Media captionEcuador's foreign minister Ricardo Patino: "We believe that his fears are legitimate"
"It is important to understand that this is not about Mr Assange's activities at Wikileaks or the attitude of the United States of America. He is wanted in Sweden to answer allegations of serious sexual offences," Mr Hague added. Will Grant, the BBC's correspondent in the Ecuadorean capital Quito, said opponents of President Rafael Correa on the national assembly felt the diplomatic spat with Britain was unnecessary and Ecuador had no right to get involved. In Sweden, foreign ministry spokesman Anders Joerle said it was "unacceptable that Ecuador would want to halt the Swedish judicial process". He added that Sweden "emphatically reject the gross accusations that is made against the Swedish judicial system". Claes Brogstrom, the lawyer for the two Swedish women making the sexual assault complaints against Mr Assange, said their ordeal seemed to have been overlooked by Mr Assange's supporters. He insisted that the allegations against Mr Assange would be treated as a "normal case" in the Swedish judicial system. "He will be interrogated by the prosecutor. The prosecutor after that has to decide whether to prosecute him or not and if that happens there will be a trial in the court of Stockholm. "There's no demand from the United States that he should be extradited to the US," Mr Brogstrom added.